Master of Law: In International Commercial and Financial Law (Oil and Gas), (February 2014); School of Law, Social Science and Communications, Wolverhampton University, The UK. B.A Degree: Faculty of Law, Soran University (2010). Master of Law: In International Commercial and Financial Law (Oil and Gas) with Merit (February 2014); School of Law, Social Science and Communications, Wolverhampton University, The UK. 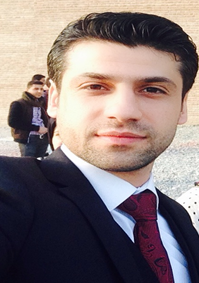 2013 till now: Lecturer, Faculty of Law, Soran University. 2015 till now: Lecturer, Rwandz Private Technical Institute. 2011: Employee (Assistant Legally/ instructor), Faculty of Law, Soran University. 1. Drugs in Kurdistan Region/2015 (book). 2. Strategy of Oil Contract Negotiation, International Journal of Business and Social Science, Vol. 6, No. 9, September, 2015, (Article). 3. Compare and Contrast Offtake Agreements and Concession Agreements, Journal of Law, Policy and Globalization, Vol. 57, 2017 (Article). 4. Legal Protection for Confidential Information in International Oil and Gas Contracts, Journal of College of Law for Legal and Political (Article).